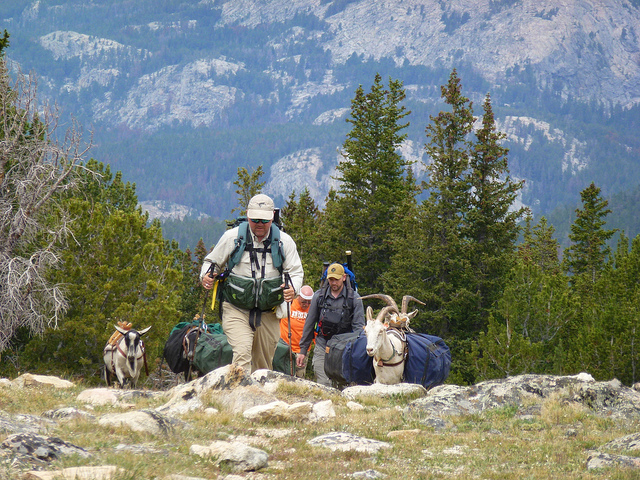 The North American Packgoat Association was founded in 1999 by a group of goat packers at the first rendezvous held in Carson, Washington at the Wind River Work Center on Forest Service land. It was named this as we wanted to encompass more than the USA as we had Canadian members right from the start. The name is pronounced NAP-GA, as the name NAPA was already taken by an auto parts franchise. We also agreed to the name “packgoat” since packhorse is the preferred way of referring to horses that pack. Much of the history of NAPgA is archived in Goat Tracks magazine, which was started by Ellen McMaster and John Mionczynski in Fall 1995. NAPgA was the brainchild of George Bogdan, Mike Silverman and Carolyn Eddy. 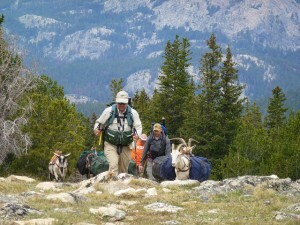 It came after the Sawtooth National Forest attempted to regulate goat packing to include things such as high lining, leading on trails and tethering in camp–issues that have plagued us until today. It seemed obvious that a national organization was going to be necessary to help with these issues nationwide, as goat packers otherwise had no voice in public land use management. NAPgA is currently in the midst of fighting a large court battle with the Forest Service over their illegal closure of public land to packgoats without proper procedure. NAPgA is here to keep the bureaucrats honest and promote sensible regulations that will protect both wildlife and goat packers rather than the outright bans proposed by the government.